Steaks with mushrooms and gravy top the list of protein-dense favorites, followed closely by chimichurri steaks smothered with a delicious parsley-cilantro-garlic sauce. However, the most basic steak with pepper and salt, is often the most rewarding, especially when served with a side of freshly roasted asparagus with shiitakes and a hint of thyme. You’ll want to offer refreshments to go with this meal, lemonade with a sprig of thyme should do the trick! But what kind of steak to choose? Now that is a tough question, after all, you don’t want your steak to be too chewy. The best bites will come from the short loin, though other cuts of beef have much to offer – it is a matter of knowing just how to cook the specific cut you bring home from the butcher. Ribeye steaks are a classic choice for grilling, with or without the bone, followed by strip steaks. You might even find the latter labeled as top loin steaks and they will vary from time to time based on the age of the animal, how it was graded, and the amount of marbling. Nonetheless, both are excellent choices! If you are going for tenderness, beef tenderloin is aiming to be the most tender cut of beef. Sample different cuts of steaks to honor all parts of the animal, even try a bison steak if the opportunity ever walks your way. Place the asparagus and shiitake in a bowl. Drizzle with the avocado oil, sprinkle with thyme and season to taste. Place the shiitake mixture in a baking dish and roast in the oven for 12 to 15 minutes. Season the steaks equally with the black pepper, and add salt to taste. Grill the steaks for 3 to 4 minutes on each side, depending on your desired doneness; let rest for 5 to 6 minutes. 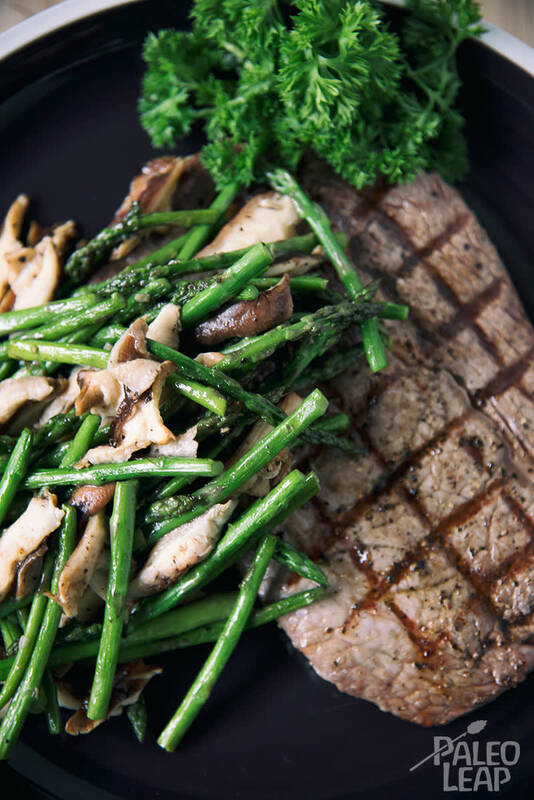 Serve the steaks with the asparagus and shiitake mushrooms.